You will probably find a lot of common ground reading their answers in the days to come. Our sixth contributor to be interviewed is cartoonist/illustrator Jonas Andersson. 1. My first thought was the roleplaying game (The Call of Cthulhu, ed. note), but actually it must have been ”The Music of Erich Zann” that was featured in a Hitchcock Presents short story collection. 2. My favourite would probably be ”The Shadow Over Innsmouth”. 3. 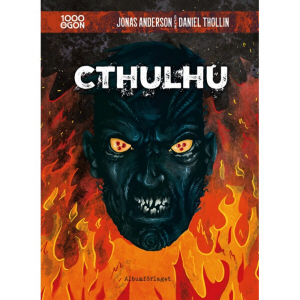 Myself and Daniel Thollin have just released our latest graphic novel, 1000 Ögon: Cthulhu. A stand alone sequel to last year’s 1000 Ögon: Lovecraft. It will be availabe for purchase at the festival.